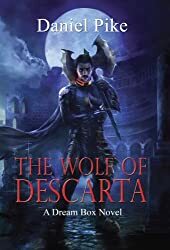 The Wolf of Descarta is the first in the Dreambox series by Daniel Pike and is a sci-fi adventure not for the faint of heart! Take our world years from now when humans are scattered to the ends of the galaxy to colonize other planets. Add a caste system based on intelligence and a personalized video game system that fully integrates you into the program. You have the Dreambox. Jaren Reese, a lower class garbage man, can be a hero in the Dreambox, and is a natural leader. When tragedy strikes the Dreambox, it comes down to Jaren and a few other misfit outcasts to ban together and, yes, literally save their world. Except, the enemy they thought they were fighting might not be the biggest threat after all. Wolf of Descarta is a great sci-fi, and that’s not even my genre of choice. The characters are intriguing, complex, and flawed. They make wrong judgment calls and get lost in things that aren’t important, just like real people. That makes the story so much more realistic and thought provoking. There are elements of romance, but that brings our characters into themselves too. The writing style by author Daniel Pike is tight, strong, and compelling. If you like the sound of this one, check out The Wolf of Descarta on Amazon or via author Daniel Pike’s website. Book two will release in November 2014!